How can I make my pond more shallow and level? (the pond is beneath a tree - stupid decision) and other muck and as far as I can bend over is not enough and I got old and I had a hip replacement and so doing this chore is not what it was 20 or 10 years ago. I made it that deep because I had some goldfish and they need the depth but despite that and despite other things I've done they have only survived ONE winter (two years ago), which makes me sad. 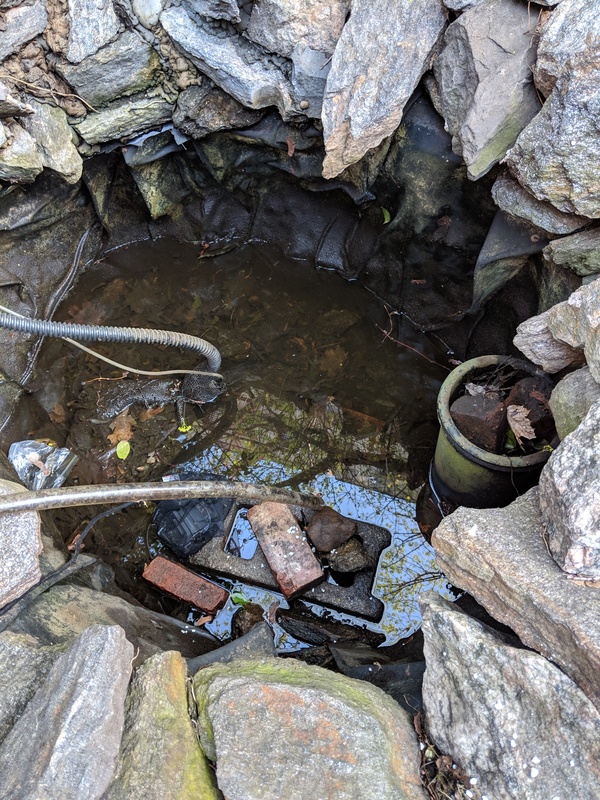 Also the pond was not leveled properly so that when I put plants in, first I have to put bricks in and then the pots on the bricks but because the pond isn't really level enough, everything topples over during the summer and I CAN'T TAKE IT ANYMORE! SO -- what I want to do is fill in some of the pond and level whatever that is so that I would now have a pond that's, say, 15" deep. I could still have a few goldfish, but now I would take them inside for the winter. And I could clean it easily, put plants in, and be PONDHAPPY once again. So -- what should I/paid person pour in there? If you are still reading, here is my adorable pond from last summer -- after almost killing myself emptying it, cleaning it, and refilling it. I mean, is there a reason cement won't work? People on a Facebook ponds group are all saying, "NO NO NO! you can't use cement in there!" but they don't say why. I get the impression it'll rip the liner which is DEATH to a pond. Yeah as it cures concrete will put weird forces on the liner, and the liner will put weird forces on it. You are likely to end up with cracked concrete and a torn liner, that’s why they pond people say no. Also that depth and diameter is a difficult pour to cure properly even without the liner. I’d just use river gravel, ideally a few different grades; fill with coarse then medium then fine. What if I use river gravel and leaves still get in (I even covered the pond with a net this winter! and there were the rotten leaves, still, on the bottom of the pond! mysteries of nature!) and get moldy and mucky? Will I be even worse off next year?? Have you tried using a good wet/dry vac to clean out your pond? I just started that last year after several years of back breaking cleaning and its a life-changer. Ive been through what youre dealing with, went from 3 feet to about 24 inches, and just hired someone to do it, replacing the liner, and my small waterfall actually looks nicer with a different arrangement of rocks. Now at 24", it was still hard to clean until I started using the wet/dry vac. I do put flagstone rocks on the sides and bottom for looks, and in the middle for birds to stand in, but it certainly diesnt help with cleaning. At 9 inches though, your fish will possibly be suseptible to scavenging by animals such as racoons, depending on where you live. This happened to me at 3 ft when I accidentally let the water level drop. Do as suggested with gravel/stone,etc. And in the fall when the leaves fall put a screen over it to prevent leaves even getting in the pond. A catfish and some snails should help naturally take of debris. Part of the problem is that that is a very small ‘pond’ of a size and shape that doesn’t really exist often in nature (and almost never for very long), so it takes time and labor to keep it nice and relatively balanced, because you are basically working against the natural process. Seconding JayRwv in putting a screen over it in the fall. That’s what my mom does with her medium sized pond. Dad built her one that’s a wood frame box with screening stapled to the top and it just lays roughly over the open water. Here is a link to the pond that actually works. It's from last summer. Those fish are now dead. Here is what the pond looks like now, mid-cleaning. Waaah. oh and I HAD a net over it, but I guess leaves got in before I put the net on and sank to the bottom and rotted. That's very depressing, that I DID that and it didn't work.